The 2012 Harvard cheating scandal involved approximately 125 Harvard University students who were investigated for cheating on the take-home final examination of the spring 2012 edition of Government 1310: "Introduction to Congress". Harvard announced the investigation publicly on August 30, 2012. Dean of Undergraduate Education Jay M. Harris described the case as "unprecedented in its scope and magnitude". The Harvard Crimson ranked the scandal as the news story most important to Harvard in 2012. A teaching fellow noticed similarities between a small number of exams during grading in May 2012. The course's professor brought the case to the Harvard College Administrative Board, which reviewed all final exams, leading to individual cases against nearly half of the 279 students enrolled in the class, almost two percent of the undergraduate student body. The administrative board completed its investigation in December 2012. On February 1, 2013 Harvard revealed that "somewhat more than half" of the investigated students, estimated at 70%, were forced to withdraw. Government 1310: "Introduction to Congress" was led by assistant professor Matthew B. Platt in Spring 2010, 2011, and 2012. The course was offered to students of Harvard College and Harvard Extension School. It developed a reputation as an easy course, receiving a high proportion of "easy" or "very easy" ratings in the Q Guide, Harvard's collection of course evaluations. According to some Spring 2012 students, Platt immediately confirmed this reputation by promising 120 A's and stating that attendance was optional. Students who attended could share their notes. Grades were determined by four take-home exams. In 2010 and 2011, the take-home exams were essays, but in 2012 they were changed to a short answer format. The change corresponded with a spike in difficulty and a drop in overall score, according to the Q Guide. Students said the short answer format facilitated collaboration. Some guessed that the changes were forced from above. The spring 2012 final exam was assigned April 26 and due May 3 at 5:00 p.m. Its first page contained the instructions: "The exam is completely open book, open note, open internet, etc. However, in all other regards, this should fall under similar guidelines that apply to in-class exams. More specifically, students may not discuss the exam with others—this includes resident tutors, writing centers, etc." The use of etc. has been questioned. Students complained about confusing questions on the final exam. Due to "some good questions" from students, Platt clarified three exam questions by email on April 30. Platt cancelled his office hours on the May 3 due date on short notice. Many students received assistance from the teaching fellows. Government 1310 had its spring 2013 Harvard College course listing removed as of October 7, 2012. Platt taught the course through the Harvard Extension School only for spring 2013 and spring 2014. Grading was based on two essay exams, ten quizzes and the final. The collaboration policy forbade any collaboration. A teaching fellow noticed similarities between a small number of exams during grading in May 2012. Platt reported the suspected plagiarism in a letter to administrative board secretary John "Jay" L. Ellison on May 14. The similarities were first noticed in answers for the bonus short answer question "Describe two developments in the history of Congress that ostensibly gave individual MCs [members of Congress] in the House greater freedom and/or control but ultimately centralized power in the hands of party leadership." Some students picked the "somewhat obscure" pair of the Cannon Revolt of 1910 and Henry Clay and "all the answers use the same (incorrect) reading of the course material in arguments that are identically structured." Additional comparisons revealed possible collaboration on the other questions. The administrative board reviewed all exams over the summer and flagged roughly 125 for suspected collaboration. The suspects constitute nearly half of the 279 students enrolled in the class and almost two percent of Harvard College's undergraduate student body. Harris said the similarities include "answers that look quite alike to answers that appear to have been lifted in their entirety." Harvard enlisted "supplemental fact finders" to deal with the load. Peter F. Lake, a Stetson University College of Law professor approximated fifty hours per student totaling "essentially one administrator’s entire year of energy." Harvard announced the investigation publicly on August 30, 2012. Dean of undergraduate education Jay M. Harris justified the announcement as a springboard to raise awareness and a teachable moment. A senior under investigation dismissed this explanation, writing, "Harvard chose to go public with this story to first and foremost save their own asses." On the same day as the announcement, Harvard Faculty of Arts and Sciences dean Michael D. Smith sent an email to all faculty members informing them of the investigation and suggesting that they clarify their collaboration policies. Each student was given copies of their exams and similar ones, then had to submit a written explanation. The student met with an administrative board subcommittee and was shown the other students' statements. Some students named the classmates they collaborated with. The subcommittee recommended an action to the full board. Cases were finalized in September and December 2012. Students forced to withdraw vanished from campus as verdicts were issued every Tuesday. The administrative board completed its investigation in December 2012. Potential discipline for academic dishonesty includes a year's forced withdrawal. In May 2010 the administrative board gained the ability to "exclude" students and fail them. IvyGate published rumors that the administrative board developed a "tiered punishment scheme" based on general classes of collaboration but Faculty of Arts and Sciences spokesperson Jeff Neal stated that each case would be evaluated individually. Students could withdraw voluntarily before their cases are closed, according to an email sent by Ellison to resident deans. If convicted and sentenced to a required withdrawal, the leave of absence would be credited as time served. A forced withdrawal includes a permanent notation on the student's transcript. Harvard biology professor Richard Losick calls the note "a severe punishment" and one suspected student describes it as "almost the kiss of death in the academic realm." During their absence, students must "hold a full-time, paid, non-academic job in a non-family situation, for at least six consecutive months" before becoming eligible for readmittance. On February 1, 2013, Smith revealed that "somewhat more than half" of the students were forced to withdraw "for a period of time" and "roughly half" of the remainder were put on disciplinary probation. Smith's e-mail covers all administrative board cases for the past term without mentioning Government 1310 or the scandal, but a Harvard official said they were from one course. For the majority of cases, the "period of time" is two semesters according to students. Harvard Crimson varsity team athletes will lose a year of Ivy League eligibility if they play any games and are forced to withdraw. If they register and attend classes before withdrawing, the Harvard Department of Athletics Student-Athlete Handbook says "In nearly all circumstances, [they] will be ineligible to compete in the first year [they] return to Harvard." According to estimates by students, over half the class and up to half of those suspected are athletes. The Harvard Crimson football team is expected to lose players, but it won its season opener. None of the starters left the team. Sports Illustrated reported that Kyle Casey, current co-captain and leading scorer of last year's 2011–12 Harvard Crimson men's basketball team withdrew from Harvard ahead of the registration deadline. The Boston Herald reported that co-captain Brandyn Curry was expected to withdraw also. On October 9, 2012 a team spokesperson confirmed that they “are not playing this season.” Platt highlighted a group of baseball players in his letter to the Ad Board. One athlete told The Boston Globe that his teammates combined notes while travelling on their team bus. Four ice hockey players including Patrick McNally left the team. In a telephone interview with The Associated Press Harvard president Drew Faust said that athletes should not be set apart or given special treatment. Faust said "It is not about one student group. It’s not confined to any one student group." Athletes and non-athletes have withdrawn voluntarily. Students claimed that collaboration like note-sharing and consulting teaching fellows was widespread. One student produced shared lecture notes and argued successfully that they were the source. Students under investigation complained about uncertainty stemming from the length of the investigation and the Administrative Board's hiatus over the summer. One 2012 graduate now working on Wall Street told Bloomberg Businessweek "Dragging us into this investigation now, when we have financial obligations and jobs, seems very unfair." Current students expressed concerns about pro-rated tuition costs where students forced to withdraw later would pay more. Some students did not receive their verdicts until shortly before finals. In the interest of "financial equity," Harvard calculated tuition refunds for all required withdrawals based on September 30, 2012. Harvard Extension School students wrote to The Boston Globe and GovLoop to debunk claims that Platt encouraged collaborating on exams. A number of students responded to Harvard's announcement by going to the media themselves and "trying to present the other side" of the story. A senior reached out to The New York Observer and Salon. He told Salon "we’re being scapegoated" and that many students are ready to file lawsuits. One student who had contacted a lawyer told The Harvard Crimson "Harvard has created this war between the students and the fricking school, and this is a war that I am willing and very eager to fight." Experts said that Harvard can be sued for procedural errors, lost employment opportunities or intentional or negligent infliction of emotional distress. After the final announcement, lawyers said that lawsuits would be difficult and unlikely. Harvey A. Silverglate said "Schaer vs. Brandeis makes Harvard very close to invulnerable." One lawyer said students may be waiting to graduate and avoid retribution. The statute of limitations for breach of contract is six years in Massachusetts. Harvard Crimson's survey of graduating seniors of the class of 2013 estimated 32.0% cheating on "papers or take-home tests" but self-reported 7.0%. An honor code was drafted by Harvard’s Committee on Academic Integrity and adopted on May 6, 2014 by the Faculty of Arts and Sciences by "overwhelmingly" positive vote. Colin Diver, former president of Reed College writes that an "Honor Principle" must be the basis of a culture of academic integrity. Some professors defended the take-home exam format. Erika Christakis and Nicholas A. Christakis write that there is a "national crisis of academic dishonesty." Harry R. Lewis entreats Harvard to "Know Thyself." Howard Gardner writes that the case exposes "ethical rot" at Harvard. Gardner contemplates the scandal "as a play in four acts." Faust, Smith and Harris made statements regarding the investigation at the first Faculty of Arts and Sciences meeting of Fall 2012 on October 2. Faust also granted an interview with The Harvard Crimson. She refused comment on student athletes saying the investigation "includes a wide spectrum of students." The instructors of Harvard's Expository Writing Program are using the scandal to accentuate the anti-plagiarism principles they have already been teaching. Thomas G. Stemberg, prominent Harvard alumnus and Staples Inc. founder wrote a heavily critical letter addressed to Faust dated January 6, 2013. Stemberg is co-chair of the Friends of Harvard Basketball fundraising group. The 2012–13 Harvard Crimson men's basketball team lost two stars to the scandal. Stemberg criticized Harvard for punishing students who used collaborative notes alongside those who copied answers. He alleged that students had escaped punishment by lying in their testimony. He called Platt and other undergraduate instructors "clearly not qualified." Stemberg said to Bloomberg News "Those students who cut and pasted exam answers deserved to get kicked out. The rest of them should have been vindicated, and the faculty member fired." The other co-chair Thomas W. Mannix disapproved of how the media focused on the basketball team and individual players. Editorials by The Harvard Crimson call out widespread confusion over the acceptability of collaboration as the scandal's root cause and focus on extracurricular activity. An editorial by The Cavalier Daily blames the "poorly worded exam instructions" and the phrase "open Internet". According to an editorial by The Boston Globe, the cheating exposes a lack of quality in Government 1310. An editorial by The Christian Science Monitor examines the challenges of teaching integrity. Naomi Schaefer Riley writes in Bloomberg View that the scandal highlights problems in the college admissions process. Farhad Manjoo, writing for Slate, believes "The students should be celebrated for collaborating" as they would in the real world. Sarah Green writes in Harvard Business Review that a developed love of learning would prevent cheating. Forbes contributor Richard Levick blames Harvard for drawing out the investigation and failing to maintain confidentiality. Alexandra Petri writes in The Washington Post that cheating is caused by an aversion to failure. In The Boston Globe, Lauren Stiller Rikleen blames the Millennial Generation's inexperience on a lack of structure. A number of student newspapers published opinion pieces on cheating inspired by the event. Jonathan Zimmerman of the Steinhardt School of Culture, Education, and Human Development at New York University writes in The Christian Science Monitor that "poor teaching" encourages cheating. On February 11, 2013 The Daily Show did a segment on the scandal. The Yale Freshman Class Council designed a shirt for the Harvard-Yale football game replacing "Veritas" in the Harvard logo with "Cheaters" or "Cheatas" but the Yale Licensing Office rejected the design. The approved shirt has "Try cheating your way out of this one" on its back. Harvard won the game. Yale College Dean Mary Miller discouraged instructors from using take-home finals in direct response to the scandal. On October 23–26, 2012 The Harvard Crimson published a four-part series about the Administrative Board and the changes made in 2009–2010. The Harvard Crimson followed up with a critical editorial. One criticism is resident deans are normally trusted advisors but communications with them are not protected by privilege. On August 30, 2012 the same day as the announcement, Harvard Faculty of Arts and Sciences Dean Michael D. Smith sent an email to all faculty members informing them of the investigation and suggesting that they clarify their collaboration policies. Harris reminded instructors that course syllabi must contain explicit collaboration policies before the Spring 2013 semester. Some classes also went over their policies in their first lecture. Resident deans have separate administrative and personal email accounts. The first search examined only the administrative account. The Harvard Crimson called on Hammonds to resign, stating: "Since Hammonds provided misinformation regarding the highly sensitive issue of email searches, and since she violated clear policy regarding those searches, her presence at the helm of the College stands as a roadblock to rebuilding trust between students, faculty, and the administration." An outside investigation run by Michael B. Keating of Foley Hoag found that the searches were done in good faith. ^ a b c d e f g "College announces investigation | Harvard Gazette". News.harvard.edu. Retrieved 2012-09-04. ^ Richard Pérez-Peña;Jess Bidgood (2012-08-30). "Harvard Says 125 Students May Have Cheated on Exam". Cambridge (Mass): NYTimes.com. Retrieved 2012-11-02. ^ a b c d e Richard Pérez-Peña (2012-08-31). "Students of Harvard Cheating Scandal Say Group Work Was Accepted". NYTimes.com. Retrieved 2012-11-02. ^ a b c d e f g h i j k l m n o Robbins, Rebecca D. (2012-08-30). "Harvard Investigates "Unprecedented" Academic Dishonesty Case | News | The Harvard Crimson". Thecrimson.com. Retrieved 2012-09-04. ^ News, Crimson (2012-12-31). "TOP 12 NEWS STORIES OF 2012 | News | The Harvard Crimson". Thecrimson.com. Retrieved 2013-01-08. ^ a b c d "Harvard investigates 125 students for cheating on final exam - Boston.com". Articles.boston.com. 2012-08-30. Archived from the original on September 6, 2012. Retrieved 2012-09-05. ^ a b "With Investigation Complete, Harvard Plans a Cheating Scandal Announcement | News | The Harvard Crimson". Thecrimson.com. Retrieved 2013-01-22. ^ a b c d Landergan, Katherine (2012-09-30). "Half of students in Harvard cheating scandal required to withdraw from the college - Harvard - Your Campus". Boston.com. Retrieved 2013-02-01. ^ a b c Pérez-Peña, Richard (2013-09-16). "Students Accused of Cheating Return Awkwardly to a Changed Harvard". The New York Times. ^ a b c d e f g h "Cheating Scandal Erupts After Short-Answer Questions Added To Congress Exams | News | The Harvard Crimson". Thecrimson.com. Retrieved 2012-09-04. ^ "GOVT E-1310 Home § Introduction to Congress (Spring 2012)". Isites.harvard.edu. Retrieved 2014-05-26. ^ "Harvard Q | Home". Q.fas.harvard.edu. Retrieved 2012-09-04. ^ a b c d Halperin, Alex (2012-08-30). "Accused student: Harvard "out for blood"". Salon.com. Retrieved 2012-09-05. ^ a b c d "Harvard Students Fighting Allegations of Cheating on Exam". Businessweek. Retrieved 2012-09-04. ^ a b c d e f "Concerns raised over Harvard's handling of cheating scandal - Metro". The Boston Globe. Retrieved 2013-01-29. ^ a b 9. "Try BostonGlobe.com for FREE". Bostonglobe.com. Retrieved 2012-09-21. ^ 9. "Try BostonGlobe.com for FREE". Bostonglobe.com. Retrieved 2012-09-21. ^ Pesek, William (2012-09-04). "How to Stop Cheating at Harvard (and Yale)". Bloomberg. Retrieved 2012-09-21. ^ "Gov 1310 No Longer Listed for Next Semester | News | The Harvard Crimson". Thecrimson.com. Retrieved 2012-10-08. ^ "GOVT E-1310 Home § Introduction to Congress (Spring 2013)". Isites.harvard.edu. Retrieved 2013-04-10. ^ "Introduction to Congress". Extension.harvard.edu. Retrieved 2014-05-26. ^ a b "Government 1310 - Introduction to Congress" (PDF). Harvard. Retrieved 2014-05-26. ^ a b c d e "Typo at Root of Cheating Scandal, Letter Reveals | News | Collection | The Harvard Crimson". Thecrimson.com. Retrieved 2012-09-12. ^ a b c "Harvard undergraduate academic misconduct investigated". Harvard Magazine. Retrieved 2012-09-10. ^ a b "Administration Makes Changes To Cope with Cheating Scandal | News | The Harvard Crimson". Thecrimson.com. 2012-09-13. Retrieved 2012-09-17. ^ a b c d e Cook, Mercer R. "Students Accused in Cheating Scandal Frustrated by Uncertain Process | News | The Harvard Crimson". Thecrimson.com. Retrieved 2012-09-04. ^ a b Hackett, Gina K. "Professors Emphasize Collaboration Policies on First Day of Shopping Week | News | The Harvard Crimson". Thecrimson.com. Retrieved 2012-09-05. ^ a b Levitz, Jennifer (2012-08-31). "Harvard Probes Allegations of Cheating on Exam - WSJ.com". Online.wsj.com. Retrieved 2012-09-06. ^ a b c d e f g Lauerman, John (2013-02-01). "Harvard Students Forced to Withdraw in Cheating Scandal". Bloomberg. Retrieved 2013-02-05. ^ a b Robbins, Rebecca D. (September 6, 2012). "Ad Board Reform of 2010 Led to More Options, More Dishonesty Cases". Harvard Crimson. Retrieved April 18, 2013. ^ Robbins, Rebecca D. (September 11, 2012). "Cheating Scandal To Be Reviewed Case-by-Case". Harvard Crimson. Retrieved April 18, 2013. ^ J.K. Trotter (September 9, 2012). "Harvard to be Harsh on 'Intro to Congress' Cheaters: New Details". IvyGate. Retrieved April 18, 2013. ^ Writer, No (2013-05-01). "Text of Leaked Email Originally Sent by Ad Board Secretary to Colleagues | News | The Harvard Crimson". Thecrimson.com. Retrieved 2013-05-14. ^ a b Cook, Mercer R.; Robbins, Rebecca D. (October 23, 2012). "Ad Board's Educational Mission Under Scrutiny". Harvard Crimson. Retrieved April 18, 2013. ^ a b O’Ryan Johnson / Boston Herald (2011-11-22). "Harvard cheating punishment seen as fair". Boston Herald. Retrieved 2013-02-04. ^ "Disciplinary Matters The Administrative Board of Harvard College". Adboard.fas.harvard.edu. Retrieved 2013-02-07. ^ Print 2.1.13. "Harvard College disciplines students in cheating inquiry". Harvard Magazine. Retrieved 2013-02-19. ^ a b c "Harvard details suspensions in massive cheating scandal - Metro". The Boston Globe. Retrieved 2013-02-04. ^ a b c Feldman, Jacob D. H. (September 6, 2012). "For Accused Jocks, Athletic Regulations Complicate Decisions". Harvard Crimson. Retrieved April 18, 2013. ^ a b "Cheating case entangles athletes at Harvard - News". Boston.com. 2012-07-13. Archived from the original on September 13, 2012. Retrieved 2012-09-13. ^ Koenig, Alexander; Samuels, Robert S. (September 10, 2012). "Football Bracing for Lineup Changes Following Government 1310 Incident". Harvard Crimson. Retrieved April 18, 2013. ^ Lauerman, John. "Harvard Football Said to Risk Losing Players in Cheating Probe". Bloomberg. Retrieved 2012-09-11. ^ Feldman, Jacob D. H. (September 17, 2012). "Football Team Responds to Cheating Allegations". Harvard Crimson. Retrieved April 18, 2013. ^ Gasper, Christopher L. (October 9, 2012). "Harvard football is schooling competition". The Boston Globe. Retrieved April 18, 2013. ^ Luke Winn (September 12, 2012). "Harvard to be without Kyle Casey, Brandyn Curry in wake of cheating scandal". SI.com. Retrieved April 18, 2013. ^ Samuels, Robert S.; Sherman, Scott A. (September 11, 2012). "Men's Basketball Co-Captain Kyle Casey To Withdraw, Miss 2012–13 Season; Curry Also Implicated". Harvard Crimson. Retrieved April 18, 2013. ^ Richard Pérez-Peña (2012-09-11). "Harvard Cheating Suspects Go on Leave". NYTimes.com. Retrieved 2012-11-02. ^ Duggan, Dan. "Sources: Harvard basketball captains to miss year in wake of scandal". BostonHerald.com. Retrieved 2012-09-12. ^ May, Peter (2012-10-09). "As Season Approaches, Harvard Adjusts Roster - NYTimes.com". Thequad.blogs.nytimes.com. Retrieved 2012-10-10. ^ Connolly, John. "Crimson forge on after losses". BostonHerald.com. Retrieved 2012-10-10. ^ Botchford, Jason. "Canucks prospect linked to scandal". Theprovince.com. Archived from the original on 2013-02-04. Retrieved 2012-12-13. ^ "Riders' Michalek one of many involved in Harvard academic cheating scandal". TheGazette. 2011-03-31. Retrieved 2012-12-14. ^ "NOTEBOOK: Men's Hockey Perfect on Penalty Kill | Sports | The Harvard Crimson". Thecrimson.com. 2012-12-10. Retrieved 2012-12-18. ^ a b "University prez Faust: Cheating at Harvard not a sports problem". BostonHerald.com. 2012-09-13. Retrieved 2012-09-20. ^ a b Pennington, Bill (2012-09-18). "Harvard Cheating Scandal Revives Debate Over Athletics". NYTimes.com. Retrieved 2012-11-02. ^ a b Pérez-Peña, Richard (2013-02-01). "Harvard Forced Dozens to Leave in Cheating Scandal". The New York Times. ^ "Tuition Concerns Raised in Cheating Scandal | News | The Harvard Crimson". Thecrimson.com. 2012-09-13. Retrieved 2012-09-17. ^ "Regarding act of taking an exam, Harvard students seemed unclear on concept - Boston.com". Bostonglobe.com. 2012-09-06. Retrieved 2012-09-10. ^ Clinch, Guy W (2013-01-19). "Gov 1310: an Adult Learner's Experience with the Harvard Cheating Scandal - GovLoop - Knowledge Network for Government". GovLoop. Archived from the original on 2013-07-13. Retrieved 2013-06-27. ^ Clark, Patrick (2012-08-30). "A Harvard Student Writes In on Cheating Scandal". Observer. Retrieved 2012-09-10. ^ a b "Harvard Could Face Student Lawsuits in Fallout of Cheating Scandal | News | The Harvard Crimson". Thecrimson.com. Retrieved 2012-09-10. ^ a b c d Denise, Michelle. "Government 1310 Verdicts Leave Door Open for Lawsuits | The Harvard Crimson". Thecrimson.com. Retrieved 2013-02-14. ^ Denise, Michelle. "Concerns Linger After 'Final' Cheating Scandal Announcement | The Harvard Crimson". Thecrimson.com. Retrieved 2013-02-08. ^ Levitz, Jennifer (2013-02-01). 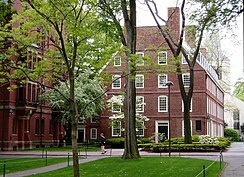 "Harvard Disciplines Dozens of Students in Cheating Scandal - WSJ.com". Online.wsj.com. Retrieved 2013-02-07. ^ Freyer, Jake. "Class of 2013 Senior Survey | The Harvard Crimson". Thecrimson.com. Archived from the original on 2013-06-23. Retrieved 2013-06-20. ^ "Harvard College's Honor Code". Harvard Magazine. Harvard Magazine. Retrieved 9 December 2014. ^ Diver, Colin S. (2012-08-31). "Students will show academic integrity — if colleges support it - Opinion". The Boston Globe. Retrieved 2012-09-05. ^ "Faculty Members Defend Take-Home Exams Despite Scandal | News | The Harvard Crimson". Thecrimson.com. Retrieved 2012-09-05. ^ Christakis, Erika (2012-09-04). "Harvard Cheating Scandal: How to Respond to Academic Dishonesty | TIME Ideas | TIME.com". Ideas.time.com. Retrieved 2012-09-10. ^ "Harry R. Lewis: Harvard, Know Thyself". Huffingtonpost.com. 2012-09-17. Retrieved 2012-09-19. ^ "Harvard scandal reveals ethical rot - Philly.com". Articles.philly.com. 2012-09-12. Retrieved 2012-09-21. ^ "Harvard's Cheating Scandal As A Play In Four Acts | Cognoscenti". Cognoscenti.wbur.org. 2012-09-28. Retrieved 2012-10-02. ^ Print 10.3.12. "Harvard academic leaders address College cheating investigation". Harvard Magazine. Retrieved 2012-10-04. ^ a b "Faust Addresses Cheating Scandal | News | The Harvard Crimson". Thecrimson.com. 2012-09-30. Retrieved 2012-10-04. ^ Lee, Michelle S. (2012-11-08). "Expos Stresses Honesty | News | The Harvard Crimson". Thecrimson.com. Retrieved 2012-11-16. ^ a b c d e Auritt, Elizabeth S. "Alumnus Slams Harvard's Handling of the Cheating Scandal | The Harvard Crimson". Thecrimson.com. Retrieved 2013-01-28. ^ a b c d Writer, No. "Text of Stemberg's Letter Addressing the Cheating Scandal | The Harvard Crimson". Thecrimson.com. Retrieved 2013-01-28. ^ "Harvard : Harvard Friends Groups". Gocrimson.com. Retrieved 2013-01-28. ^ Denise, Michelle. "'More Than Half' of Ad Board Cases Last Fall Led to Withdrawals, Harvard Says | The Harvard Crimson". Thecrimson.com. Retrieved 2013-02-06. ^ "Delineating Dishonesty | Opinion | The Harvard Crimson". Thecrimson.com. Retrieved 2012-09-04. ^ "Conducive to Cheating | Opinion | The Harvard Crimson". Thecrimson.com. Retrieved 2012-09-17. ^ "The Cavalier Daily: Crimson Handed". Huffingtonpost.com. 2012-09-04. Retrieved 2012-09-05. ^ September 6, 2012. "Harvard cheating scandal reveals gaps in costly education - Boston.com". Bostonglobe.com. Retrieved 2012-09-07. ^ "Integrity and the Harvard cheating scandal". CSMonitor.com. Retrieved 2012-09-20. ^ Barro, Josh. "Cheating at Harvard Exposes an Admissions Game". Bloomberg. Retrieved 2012-09-05. ^ Manjoo, Farhad. "Harvard cheating scandal: Everyone has it wrong—the students should be celebrated for collaborating on an unfair test. - Slate Magazine". Slate.com. Retrieved 2012-09-05. ^ Green, Sarah. "Cheating at Harvard, and in the "Real World" - Sarah Green - Our Editors - Harvard Business Review". Blogs.hbr.org. Retrieved 2012-09-06. ^ Richard Levick (2012-04-18). "Why Harvard Mishandled Its Cheating Scandal". Forbes. Retrieved 2012-09-06. ^ Petri, Alexandra (1970-01-01). "The Harvard cheating scandal and the end of failure - ComPost". The Washington Post. Retrieved 2012-09-21. ^ Rikleen, Lauren (2012-09-14). "Cheating and the Millennial generation - Boston.com". Bostonglobe.com. Retrieved 2012-09-21. ^ "Arizona Daily Wildcat :: Harvard scandal casts spotlight on how colleges fight cheating". Wildcat.arizona.edu. Retrieved 2012-09-07. ^ "Quite Thought Full - Opinions - The Duquesne Duke - Serving Duquesne University since 1925". The Duquesne Duke. Retrieved 2012-09-07. ^ "Honor codes put in spotlight". The Daily Tar Heel. Retrieved 2012-09-07. ^ "Editorial: Succumbing to academic pressure - The Brown Daily Herald - Serving the community daily since 1891". The Brown Daily Herald. 2012-09-12. Retrieved 2012-09-19. ^ Jonathan Zimmerman. "Harvard cheating scandal? It could be bad teaching". CSMonitor.com. Retrieved 2012-09-24. ^ "Crimson Lied - The Daily Show with Jon Stewart - 02/11/13 - Video Clip | Comedy Central". Thedailyshow.com. Retrieved 2013-02-12. ^ Schwarz, Hannah (November 2, 2012). "Officials reject FCC's "Cheaters" shirt for The Game". Yale Daily News. Retrieved April 18, 2013. ^ Lee, Michelle S. (November 5, 2012). "Yale's Harvard-Yale Game Shirt Design Rejected". Harvard Crimson. Retrieved 2012-11-06. ^ a b Schwarz, Hannah (November 12, 2012). "Licensing office approves FCC shirt design". Yale Daily News. Retrieved April 18, 2013. ^ Sherman, Scott A. (November 17, 2012). "Harvard Rallies To Top Yale, 34-24, in 129th Game". Harvard Crimson. Retrieved April 18, 2013. ^ Jane Darby Menton (November 28, 2012). "Miller discourages take-home finals". Yale Daily News. Retrieved April 18, 2013. ^ Ferreol, Michelle Denise L. (November 30, 2012). "Yale Dean Discourages Take-Home Exams After Harvard Cheating Scandal". Harvard Crimson. Retrieved April 18, 2013. ^ "Ad Board's Educational Mission Under Scrutiny | News | The Harvard Crimson". Thecrimson.com. 2012-10-23. Retrieved 2012-11-02. ^ a b "Ad Board's Advising System Faces Criticism | News | The Harvard Crimson". Thecrimson.com. 2012-10-24. Retrieved 2012-11-02. ^ "For Ad Board, Burdened Proof? | News | The Harvard Crimson". Thecrimson.com. 2012-10-25. Retrieved 2012-11-02. ^ "Critics Call for Student Role on Ad Board | News | The Harvard Crimson". Thecrimson.com. 2012-10-26. Retrieved 2012-11-02. ^ a b "A Penal System | Opinion | The Harvard Crimson". Thecrimson.com. Retrieved 2012-11-02. ^ a b Conway, Madeline R. "Classes Address Collaboration Policies | The Harvard Crimson". Thecrimson.com. Retrieved 2013-01-31. ^ Landergan, Katherine (2013-01-29). "Harvard professors write clear collaboration policies for new semester after cheating scandal - Harvard - Your Campus". Boston.com. Retrieved 2013-01-31. ^ a b c d e f g h By Mary Carmichael, Globe Correspondent (2012-09-19). "Harvard University administrators secretly searched deans' email accounts, hunting for media leak". Boston.com. Retrieved 2013-03-11. ^ a b c d "Harvard defends e-mail searches, offers limited apology - News". Boston.com. 2013-03-11. Archived from the original on March 16, 2013. Retrieved 2013-03-21. ^ a b c d e "Dean's Communications | Harvard University Faculty of Arts and Sciences". Fas.harvard.edu. Retrieved 2013-03-22. ^ Kansra, Nikita (2013-03-09). "Administrators Secretly Searched Resident Deans' Email for Cheating Scandal Leak | News | The Harvard Crimson". Thecrimson.com. Retrieved 2013-04-18. ^ Fandos, Nicholas P. (2013-03-11). "Administrators' Statement on Secret Email Searches Leaves Questions Unanswered | News | The Harvard Crimson". Thecrimson.com. Retrieved 2013-04-18. ^ Fandos, Nicholas P. (2013-03-11). "Professors Call Ethics of Email Search Into Question | News | The Harvard Crimson". Thecrimson.com. Retrieved 2013-04-18. ^ Lewis, Harry (2013-03-09). "Bits and Pieces: Email Privacy at Harvard". Harry-lewis.blogspot.com. Retrieved 2013-04-18. ^ "Harvard Spies on E-mails". My Biased Coin. Retrieved 2014-05-26. ^ "At Harvard, Secrets and Lies | Shots in the Dark". Richardbradley.net. Retrieved 2013-04-18. ^ "Secret e-mail searches on Harvard cheating scandal broader than initially described - Metro". The Boston Globe. Retrieved 2013-04-03. ^ Fandos, Nicholas P. "Revelation of Second Email Search Contradicts Administrators' Previous Statement | The Harvard Crimson". Thecrimson.com. Retrieved 2013-04-08. ^ Fandos, Nicholas (2 April 2013). "Revelation of Second Email Search Contradicts Administrators' Previous Statement". The Harvard Crimson. Retrieved 19 May 2013. ^ "To Rebuild Trust, Hammonds Must Resign". The Harvard Crimson. 4 April 2013. Archived from the original on 23 June 2013. Retrieved 28 May 2013. ^ Perez-Pena, Richard (28 May 2013). "Harvard Dean Who Handled E-Mail Searches to Step Down". The New York Times. Retrieved 28 May 2013. ^ Staff, Globe (28 May 2013). "Evelynn Hammonds to step down as Harvard College dean". Boston Globe. Retrieved 28 May 2013. ^ Pérez-Peña, Richard (2013-07-22). "No Evidence Harvard Officials Read Faculty E-Mails, Report Says". The New York Times.